Nancy and I gave two workshops before Easter at the LILAC conference at the University of Manchester and at the OER conference at the University of Nottingham. Nick Sheppard wrote up our session at OER13 on the official blog. Our slides from LILAC13 are on their website. In both cases we wanted to find out from participants how a community of practice for sharing IL resources might work in practice. The findings will feed into the work of the CoPILOT committee who are working to set this up in the UK. CoPILOT is now a sub-group of the CILIP Information Literacy Group and we have an enthusiastic group who are helping us with this endeavour. More soon but do have a look at the IL-OER wiki we have set up. The next step will be to liaise with the corporate web-team to explore how the feed can be embedded in the institutional CMS. We’ve already picked a few brains and it shouldn’t be too difficult though there are still one or two technical issues including how best to submit a query; we wouldn’t want to use username as that would be a privacy issue and the preference would be email address though this will require a layer of translation from email address (which isn’t searchable)to either Leeds Metropolitan username or Symplectic internal user id. In addition, the API isn’t designed to be hammered dynamically so results need to be cached so there are questions how best to refresh that cache to reflect changes that academics may wish to make to their profile. 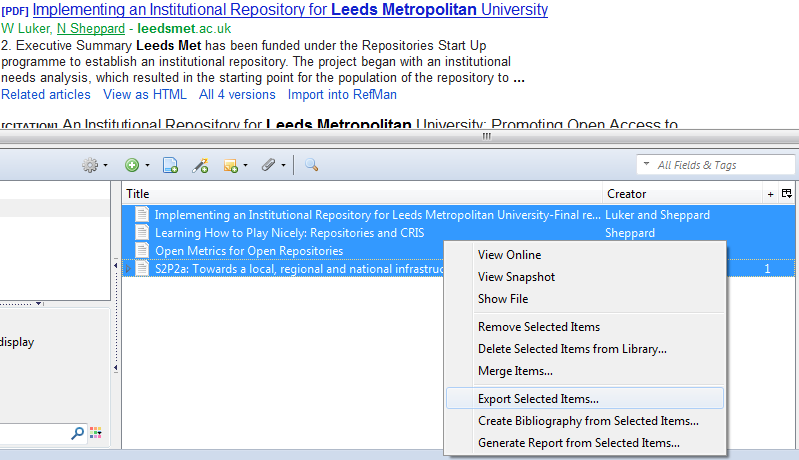 The stated aim of our Symplectic implementation – and integration with the repository – is to make it easier to maintain a constant, up-to-date picture of research activity across the University…historically, however, research management has been somewhat variable across the institution…frankly I knew this already and the repository had become the de facto research management tool but is itself far from comprehensive. Nor are the automatic data sources (Web of Science, Scopus and PubMed) likely to solve the problem, with variable results depending, for example, on the subject area and types of publication; I have also been importing existing records from EndNote libraries …where they exist, but there are still large swathes of research missing over the past 10 years or so that we are trying to cover. Especially less formal publications. 4. 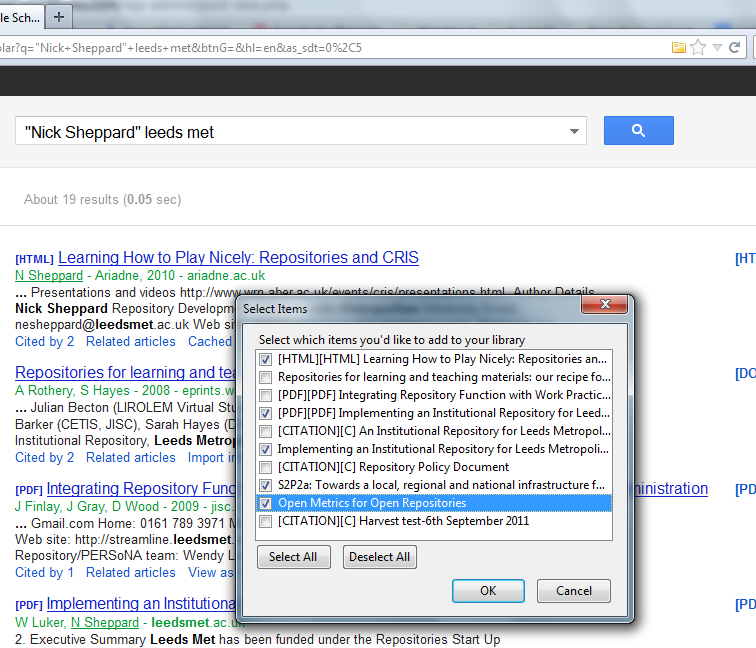 Now a search in Google Scholar should show a folder icon in the address bar. Click the folder. Choose the appropriate format (in my case RIS) and save the file to the desktop with an appropriate name for subsequent import to Symplectic / research management system of choice. Ta da! Records in Google Scholar aren’t necessarily the most reliable so care will need to be taken with this process but it’s certainly worth exploring as a method of filling the gaps in our research records.